From just a few moments into our first meeting in NE Portland, I knew I was going to really love working with Kendra and Dan. They are two of the sweetest, most down to earth individuals. 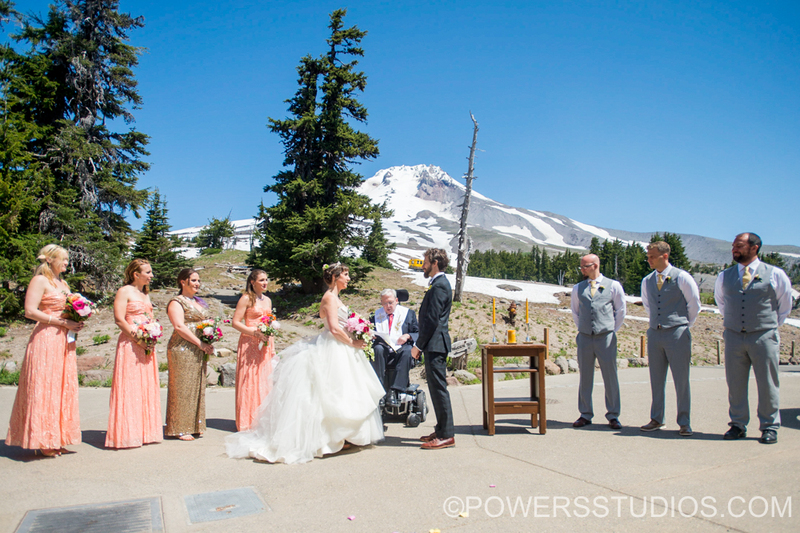 They had a beautiful weekday wedding up at Timberline Lodge. Blue skies, sunny weather, surrounded by adoring friends and family. Photos started in the morning, so I arrived up at the Lodge the night before — the sunset and stars were just too pretty to pass up, so the three of us ventured out into the snow the night before to get some really awesome sunset and star shots. Some of my favorite images from the day came from those small, quiet moments. Like Dan sitting by the fireplace mantle in his room shortly before First Look, or Kendra and Dan holding one another while looking out at Mt. Hood from the Raven’s Nest during the lunch reception. This is the type of wedding I absolutely adore. Congratulations you two, it was so much fun and I can’t wait for you to see the final images! A big thanks to all the vendors that helped make this day special!